The Book of Malachi, is the last of the books of the Old Testament. The book is made up of four chapters and a total of fifty-five verses. The word Malachi means my messenger. 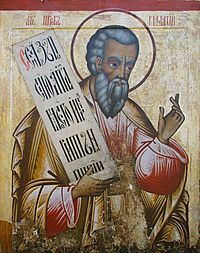 It is thought that the book was written by the Prophet Isaiah. The date of the book would then be sometime around 740 to 690 BC. Book of Malachi Facts for Kids. Kiddle Encyclopedia.